The restaurant Il Ciocco, is entirely derived from a limestone wall that overlooks the Gregorian Spa, enjoying a privileged location, exclusive and priceless. 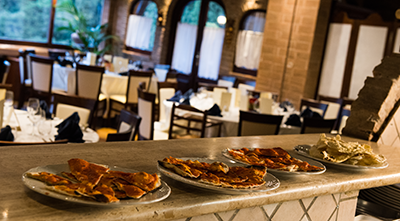 The restaurant is fully immersed in the park of Villa Gregorian which blends traditional Italian history and culture. The most unique and fascinating caves is represented by the Gregorian. Produced by erosion of the ancient bed of the river Aniene, then diverted due in 1826. What remains of that water stream is then formed by a series of natural rooms in which you can trace virtually the old course of the river Aniene. Accessible only from the restaurant, thus constitute a unique attraction made available to customers. In the caves above a nineteenth-century terrace offers a wonderful view. Il Ciocco, offers its visitors a fully air-conditioned dining room and two magnificent terraces to sit comfortably and enjoy the food in the restaurant, you can enjoy the view and the beautiful waterfalls, the entrance to the Spa Gregorian and last but not least, in order of importance, the picturesque ruins of the Temple of Vesta in the Roman era built on the slopes of the valley overlooking the Falls and the Baths. These areas are devoted to various events in the program and can be used for private parties, wine tastings, banquets or simply be experienced in their natural setting and priceless. The dining area inside is able to accommodate more than 250 people and has an excellent typical cuisine accompanied by a noble wine list. In the club, nestled in the rocky walls, numerous findings give the room an air of ancient historical events that follow each other resulting in the full history of Tivoli. You can, for guests, serve the large parking area in Piazzale Massimo in front of the restaurant. Since ancient times has characterized the culture of our country. This policy, combined with the expressive capacity for art, is now one of the most traditional of Italy. Typicality, territoriality, local customs, ancient recipes and a targeted food and wine culture, constitute the historical background on which he founded the art of Italian cooking. It is important to understand this concept to realize the level of quality which boasts Italian cuisine in general. Il Ciocco, as attested to these principles, it offers a modern tradition and ancient flavors, taste in the preparation and refinement in matching food and wine. Special Il Ciocco is the ability to combine classic cuisine restaurant with pizzeria, maintaining a supreme level of quality. This dual role, in fact, represents the various appetites wide range of choices, in a unique collection of rare and prestige. All yeasts are strictly for pizza prepared by professionals and pizza cooked in a wood oven.